Maria Falzone was here once again. Her program, "Learning to Love Yourself So You Can Love the One You're With" was a huge success this past Wednesday. With nearly 300 members of the Hofstra community packed into the Student Center Theater, Maria started in a way no one expected: she told everyone to close their eyes and be present with their breath in the moment. She made us aware that our breath gets shallow as we run through our everyday lives. As each of us became relaxed, we opened our eyes and listened carefully to Maria's message of "learning to love yourself." She had the entire theater engaged in one-on-one exercises on learning how to accept "no" for an answer and how to say "no" when we aren't comfortable saying "yes." Maria emphatically shouted, "No one can get inside your head unless you let them." "Erase 'should' from your vocabulary"… and the phrase 'only if.' Maria told us that we are living in our head, but we should be living in the here and now. The message of respecting oneself was made clear in a demonstration that had us in stitches, though. She got us laughing as she brought two students to the stage to simulate the effects of alcohol on the mind and body. The audience was laughing as Maria put scarves, hats, sunglasses, coats, and gloves on their bodies and marshmallows in their mouths. It was clear that their ability to say "no" to each other and to realize what was happening was getting worse and worse as the scenario went on. Everyone was able to laugh at themselves and the hysterical stories Maria had for us. We all left feeling a bit stronger in our ability to say "no" when we become uncomfortable in our friendships and relationships. It's clear that Maria's gift for comedy and teaching self-respect was the perfect mix that had everyone learning to love themselves so they can love the one they are with. 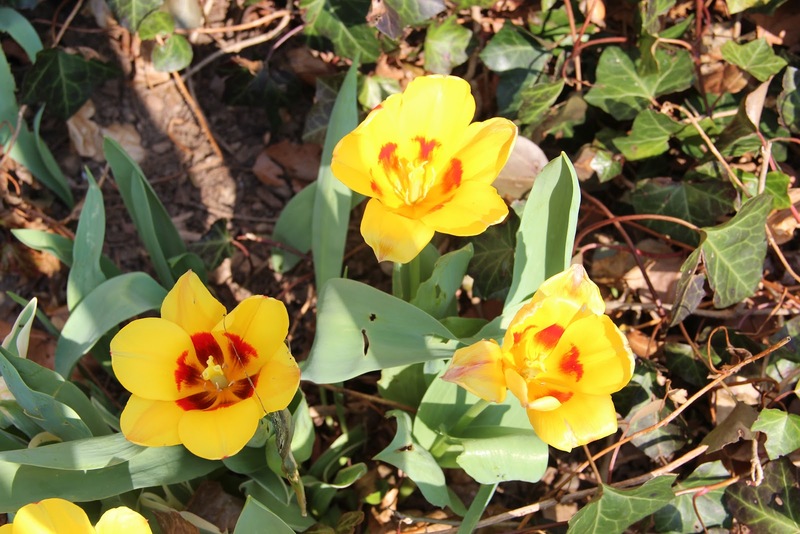 Spring arrived early this year and we at Student Counseling have been excited to get out into the university community and meet with our students. Over the past few weeks, we’ve been partnering with student groups to provide psychoeducational workshops on a variety of mental health topics including understanding depression, stress management, and healthy relationships. Hofstra students are also taking advantage of our groups offered here at the Saltzman Center. One of our popular groups continues to be our Mindfulness Meditation group held every Tuesday at 8:00 pm. As we move toward the final part of the Spring semester, we look forward to seeing many of you at a workshop or group program. For more information on this, please visit the Student Counseling Services webpage and check out our Annoucements section. Working in Student Affairs…what is the point? Key note speaker Mr. Van Jones did the kick off speech at the 2012 American College Personnel Association (ACPA) in Louisville, Kentucky and hit the point right on the money. Student affairs professional must “…make sure every student has a ladder to climb.” What he means by that is not a literal ladder to climb, but a metaphorical ladder of opportunity to grow and climb out of doubts that they may be holding onto from their past. A lot of times working in student affairs is not recognized or even noticed by students after helping them and for that reason, Mr. Van Jones had two words to say to all the seasoned and young student affairs personnel. 2012’s ACPA conference theme is “Create Possibilities” by helping professionals learn how to lead in a positive, productive way. Living in a world that is full of diversity, professionals will be attending or leading sessions about embracing the culture, learning what the trends are showing about the future and how to teach students with these latest trends. Being a student affair professional is about making sure that the students come onto our university and experience diversity in a positive manner. Mr. Van Jones closed during his speech by saying these wise words, “don’t attack the diversity, it is the key to our solution.” This being said, I want to say thank you for all of those who made an impact on my student affairs experience and made the change in me. Goodbye winter, HELLO SPRING! The 10 Best Spring Tips. Spring means flowers, blue skies, green fields, and the warm feeling of sun that brightens your day. Shake off the winter blues and get in the spring spirit. With the longer daylight hours and the warmer weather approaching, we all should make it a goal to be more active and enjoy springtime to its fullest. All of us have a favorite artist or type of music that makes us want to sing out loud and puts a smile on our face. Spring is a time of joy and love, thus whatever music makes you cheerful, is the music that celebrates your spring. Get rid of any negative thoughts. Don’t hold on to past mistakes or grudges. Replace all those negative spirits, with positive ones. Clear your mind and begin to think about your goals, plans, all the positive things in your life and start dreaming. Dreams are the start of something great. It’s never fun to work out on your own. Take some great classes offered by the Fitness Center and hard work will turn into fun. Everything else will come by itself. They offer a great variety. Take your pick between Zumba, Jazzercise, BCT, Yoga or Cycle class. Needless to say, your body will love you for it. Who does not love the beach? Personally, it just reminds me of vacations and good times. Even if it might not be warm enough yet to go for a swim, there is nothing more fueling, calming and at the same time cheerful to me then the sound of the waves and the smell of the ocean. A long beach walk is a definite must. 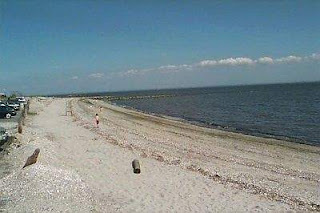 Long Beach and Jones Beach are nearby. We all know springtime is not just sunshine but also brings rain. What is better though than rain on a warm day. Wear your funkiest and most colorful rain boots and be sure to splash those puddles and go back to your childhood for just a few minutes. 7. 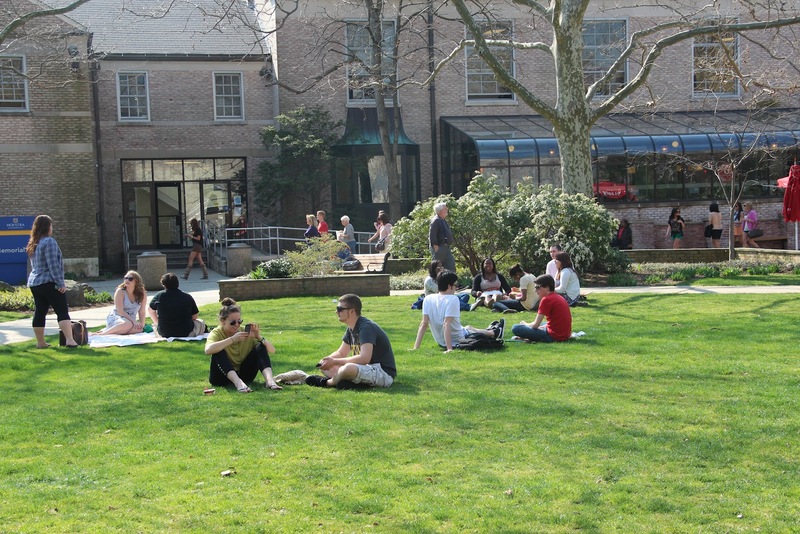 Grab a Blanket & Enjoy Hofstra’s Gorgeous Flora On a sunny day I love to bring a blanket and layout in front of Memorial Hall to soak up the sun and gaze at the beautiful flora Hofstra has to offer. Give it a try, it’s amazing for the mind and great to relax. Where’s your favorite spot on campus to soak up some sun? Any Hofstra student should know about Famous Italian Ices. No matter what your taste is, you will find it. My favorite is strawberry cheesecake and peanut butter and jelly ice cream. Delicious. And please don’t even waste a minute thinking about calories. Yes, you should eat healthy, but still eat what you love. I guarantee Ralph’s makes happiness, literally. At this point, I do have to confess, my teammates and I went to Ralph’s every single day during preseason. Sorry coach! That season … most successful season. Musicfest at Hofstra on a warm spring day = fun times. Attend Musicfest on May 5th presented by Hofstra Concerts and OSLA. Great music, a great crowd and lots of great memories guaranteed. I never thought I would ever put this one on my list, but it can be rewarding. Have fun doing it. They actually have mops you can put on your feet to clean. I got pink ones. Slipping Hazard. Besides, there are many ways to make this fun. Turn that music up loud and get your friends to help. It will feel great afterwards. And please, don’t forget to reward yourself when the work is done. Make a trip to your favorite restaurant and treat yourself. 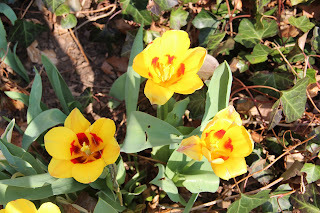 Follow those tips and I will guarantee you an amazing spring. Welcome the season with open arms. I know that spring just arrived a few days ago, but that means summer is just around the corner. Are you working on a summer plan? If not, what are you waiting for?? Internships and jobs take time to secure or arrange, so now is the time. It's also time to register for that summer class that will keep you on track for graduation. So come on-- get moving! Tell us what you're planning, and then get yourself over to the Career Center or the Center for University Advisement (CUA) so they can help your plans become reality. Class of 2012! GET EXCITED! You are the first class to experience Hofstra’s Senior Week! So…what exactly is Senior Week? I mean, I graduated awhile ago now, so the whole “senior week” thing did not apply to either of my high school or college experiences…*(cough)* Um, so based upon my amazing ability to google and research stuff, senior week seems to be a long standing tradition in some institutions, and well, the new HOT programming trend in others. All joking aside, the end of your senior year of college is one of the most amazing and yet scary moments in your life (I guess until you get married, buy a house, or have a kid?) I mean, let’s face it; you have put in at least four years of hard work studying, and socializing to get to this point. Yes, you’re about ready to earn your degree and maybe somewhere along the way, you’ve gained a better understanding of who you are. You’re hopefully beginning to reminisce about some of the memories you’ve made (or maybe you’re trying to forget some of the mistakes you may have made along the way too), and at the end of this journey you need to figure out what’s next? Holy CRAP—what’s next?! I mean is this resonating with you yet? I’m kind of jealous that I didn’t have a senior week (back in the day) when I went to college. It would have been nice to be around people like me; who were able to understand that bittersweet feeling that only a senior understands. And of course, I’m not going to lie…I would have liked to have been able to participate in a week of fun activities and get a one-of-a-kind sweatshirt that not even the bookstore can sell…just saying. Well anyway, enough about my age, or life’s bittersweet moments. The Class Programming Committee designed this exclusive week for the Class Of 2012, with the help of the Senior Class Challenge Committee, to be an exciting week of social events that mark your final few days as a Hofstra Student. Ticket sales will be held on Tuesday, March 27 from 10 a.m. to 4 p.m. in the MPR; Wednesday, March 28 from 10 a.m. to 4 p.m. in the MPR an 5 p.m. to 7 p.m. in 260 Student Center. Are you getting excited yet? Check out hofstra.edu/classof2012 for more information! 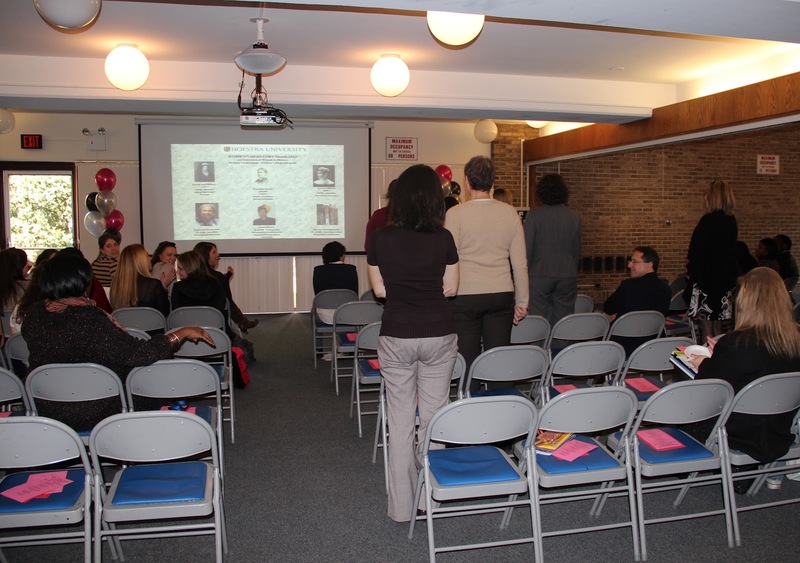 Hofstra held its first Greek Leadership Conference this past weekend. We had over 180 fraternity and sorority members, an outstanding turnout for a new tradition. 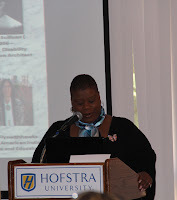 The purpose of the conference was to provide our members with the skills needed to excel within the Hofstra community and beyond. 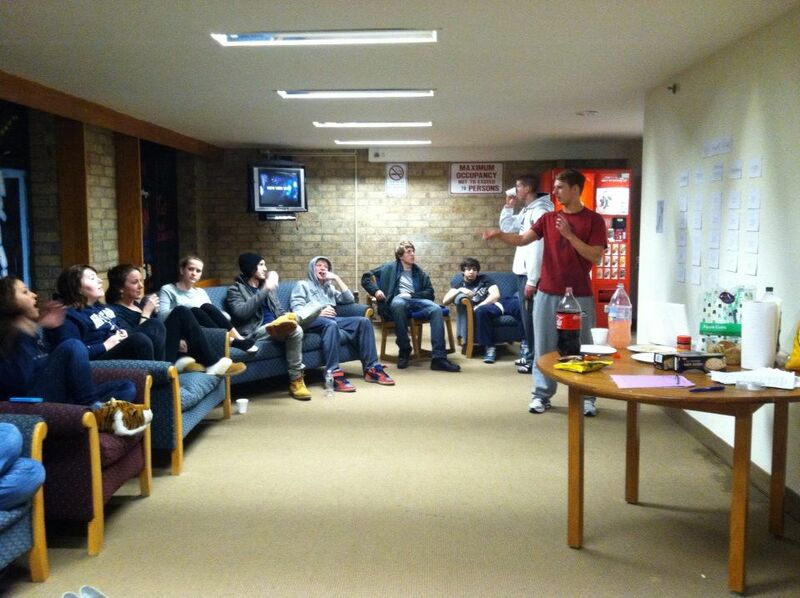 With hopes to provide our Greek Community with leadership development, intentional dialogue, and a sense of unity, the participants were exposed to sessions about risk management, using their affiliations to network, programming, recruitment, taking the next step towards leadership, and bystander intervention. The Greeks, despite not wanting to wake up by 10am on a Saturday, found the Conference to be fulfilling. The Conference started with a keynote from Don C. Sawyer III, M.S., M.A., a doctoral candidate and instructor of sociology in the Maxwell School of Citizenship and Public Affairs at Syracuse University, who spoke about his experience in Alpha Phi Alpha fraternity and rising to challenge stereotypes of Greek Life on college campuses. Hofstra administrators facilitated the next two rounds of sessions, and the Conference closed with an alumni panel. Five alumni, ranging in graduation years from 1980 to 2009, spoke about their experience of being a member of Greek Life at Hofstra University and how it helped them mature into the successful men and women they are today. I would like to thank Gerard Brogdon, Joseph Gebbie, Robyn Kaplan, Sarah Young, and Jackson George for being presenters throughout this conference. All in all, we had a lot of positive remarks from students about the experience, and we are hoping that we have paved the road for an annual leadership development opportunity for our fraternities and sororities. We hope to involve more members from the Hofstra community in the future, so if you’re interested in getting more involved, contact Mario Bolanos (Assistant Director for the Office of Student Leadership and Activities). This past Sunday, everyone seemed to be Irish at the 14th Annual Irish Experience Festival. It was a beautiful sunny day, the ideal day for the Irish Festival at Hofstra. The festivities were a great way to celebrate St. Patrick’s day early to extend the fun activities and kick off celebrations a week in advance. The crowd was as diverse as it can get. The Irish Festival was a great event for everybody whether old or young, Irish or not, male or female, there was something fun and interesting for everyone. The Irish Festival celebrates the Irish gifts of music, food and culture to America. There were a number of music and dance performances throughout the day, as well as a variety of vendors and food. If you wanted something unique, something Irish, this was the place to go. Vendors from throughout Long Island, New York, New Jersey, and New England attended the festival to portray their Irish roots. Everyone was covered in green with fun heads and customs. This was such a great event and adding to that it was for a good cause. All net proceeds benefit the Hofstra University Scholarship Fund. I really enjoyed watching how people in the U.S. celebrate their ancestry and roots. It always has been amazing to me when friends tell me about all their various backgrounds, as most Europeans just have one single ancestry. I for example, am only German. I love the multiculturalism. It is this melting pot atmosphere that I really love about this country. It is great to see how all those cultures come together into one community. This week everyone is Irish so get decked out in green and find the Irish in you. As DKMS says, "SHARE THE LOVE, JOIN THE FIGHT." DKMS is the world's largest marrow donor center. Too often when a bone marrow transplant is the cure there simply isn't a donor. The DKMS mission is to fight blood cancer and save lives by registering bone marrow donors for patients in need. In cooperation with DKMS, Hofstra co-hosted a bone marrow drive, in conjunction with the university’s semi-annual blood drive, for former student Dionis Guerrero Baez, who is battling leukemia. Yesterday's event was a great success with 84 people receiving swabs to join the international registry. Help somebody else to live. This inspired everyone, including me. I am now officially a proud, registered bone marrow donor. There is no better feeling than knowing you can possibly save somebody's life. I truly hope my bone marrow will match Dionis Guerrero Baez's or anybody else's in the world. I am so glad Hofstra supports this cause. It encouraged me to do so, and hopefully many others. You can make a difference. All those 84 individuals that took part in the bone marrow drive, are now in the international bone marrow donor registry. They can be a match to all of the many people fighting blood cancer around the world. Share your love and you will receive love. I know we will find a match for Dionis Guerrero Baez to enable him to live the life he dreams of and be able to fulfill his wish to resume his studies at Hofstra University. I cannot wait to see him walk through campus, healthy, with a smile on his face. YOU can help make this happen. I hope I did. 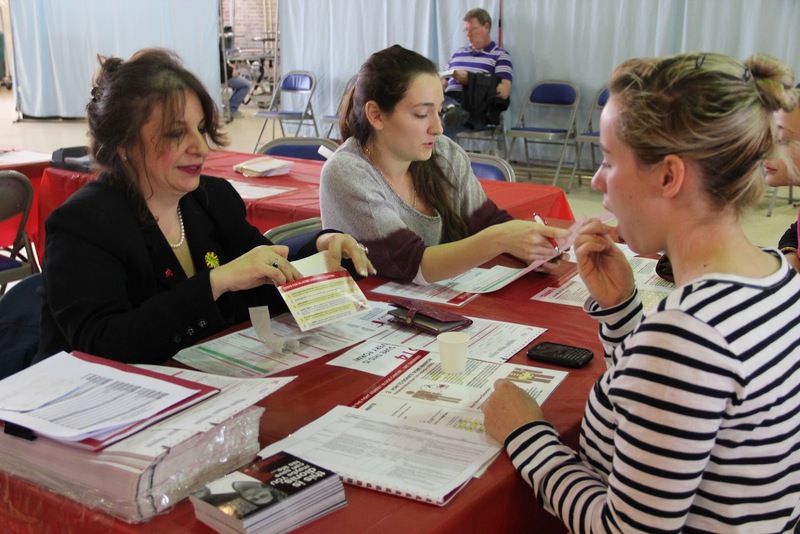 If you missed the event yesterday, then you can visit the DKMS website and register online. You will receive your Do-It-Yourself cheek swab kit in the mail, collect your sample and send it to the lab for tissue typing. You might be a match and help somebody else to live the life they dream of. SHARE THE LOVE, JOIN THE FIGHT! 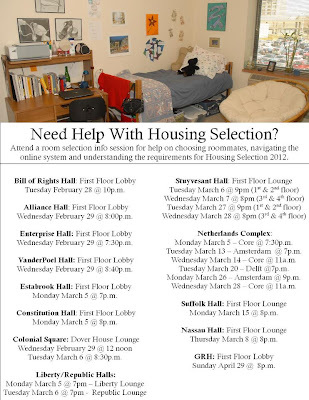 Housing Selection is now in Order! All the locations and dates for info sessions. Students living on campus have been figuring out which residential hall they want to live for the Fall semester of 2012. A lot of students have been asking and trying to figure out how the process works. 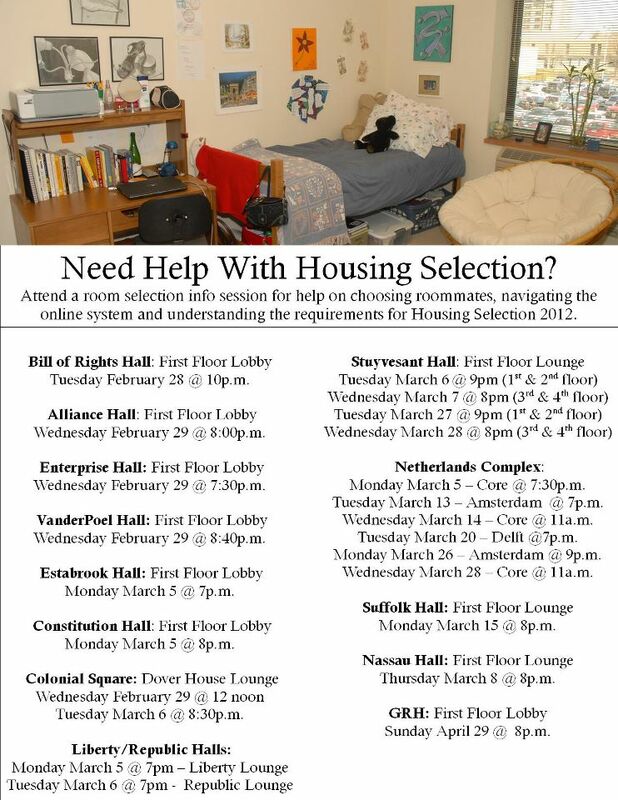 Residential programs have set up dates in each residential hall that will help provide the information that you need! Cannot make it to your own building’s meeting? That is fine. All the information at these sessions apply to everyone, be sure to stop by one! Q: What are the eligibility requirements to participate in room selection? · Register as a full-time student for the Fall 2012 semester by Friday May 25, 2012. Q: There’s a lot to do! What order do I do it all in? A: First, meet all eligibility requirements. Secondly, pay your housing deposit. Thirdly, update your housing application. Lastly, participate in whichever process you select on the dates advertised. Q: What if I miss my dates to participate in selection? A: Residents who have paid their deposit but have not selected a housing assignment by the end of the housing selection process will be contacted by the Office of Residential Programs with further information about how to proceed. Q: I’m homesteading and my roommate is not returning to the room. Does my roommate have to do something in order for that to work? A: Yes! Your roommate, must also update his or her housing application to indicate that they will not be homesteading their space. After they do this, you will be able to pull another student into that space. Graduating students do not have to participate in the selection process. Q: I want to live in the co-ed housing option that was recently advertised. May I do that online? A: Students who wish to apply for the co-ed housing option must complete a paper application with the Office of Residential Programs on March 19, 2012 in room 244 Student Center. Applicants must still submit their $300 housing deposit by the advertised deadline. Spring is just around the corner and for many of us here at Hofstra, that means it's time to get our spring haircuts! For the 5th year, and my 3rd year as a participant, the Hofstra Men's Roller Hockey Team will be holding their annual St. Baldrick's Day event. The event will take place next Wed., March 14th, during common hour in the Student Center Atrium. This is a collective effort by students, faculty, and members of the administration. Last year almost $10,000 was raised in support of children's cancer research. This year, as an added challenge to our community, some special folks here at Hofstra have graciously agreed to go under the "buzzer" if we reach certain fundraising milestones. 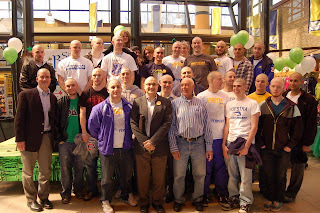 The goal for this years event is $25,000 and Provost Herman Berliner has agreed to shave his head if we meet this goal. Men's Head Soccer Coach Richie Nuttal, Chair of the Dept. 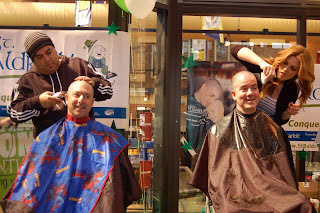 of Sociology and Co-Director of the CCE, Greg Maney, and myself, have all agreed to shave our heads if we surpass $10,000. And Mario Bolanos, our Greek Advisor, has said he would do so as well if the Hofstra Greek community can collectively come up with $5,000 for this cause. How many of you have said something on your Facebook or Twitter that you later realized didn’t portray your best image online? Whether it was something about your job or about your boyfriend, we’ve all thought of ranting about something on our status updates. But before you tweet about your latest breakup, take a moment to think about what an employer would think if he or she took a look at your Twitter page. At Wednesday night’s “Keeping it Real…Professional on Social Media” event, students learned all about what employers are looking for when it comes to prospective employees’ or interns’ online images. 1. “The internet is in ink, not in pencil.” In other words, whatever you or someone else puts on the internet stays on the internet. The internet isn’t Las Vegas, and what happens there doesn’t always stay there. Just because you remove a photo or a status update doesn’t mean it’s gone forever. Someone could have already taken a screenshot of that tweet or saved that photo. Always be safe by only posting pictures or updates that you are okay with employers seeing. 2. “Facebook is the people I know. Twitter is the people I want to know.” Follow people on Twitter who inspire you or who are at companies or in an industry you want to work in. You can make great connections on Twitter that you might not be able to make in the real world. 3. “LinkedIn is a living, breathing resume of yourself.” Make sure that your LinkedIn profile reflects everything that you do and what you are all about. Keep it updated with your volunteer work, your internship experience, and your work within student organizations. Join groups on LinkedIn to become more involved in your field. The more complete your profile on LinkedIn, the better. If you want more information on how to effectively use LinkedIn in your job or internship search, check out “The Insider’s Guide to LinkedIn” this Tuesday at 6:30 pm in the Student Center Plaza Rooms. Lindsay Pollak, Global LinkedIn expert and author of “Getting from College to Career”, will be here to share her insider secrets on using the social media site. Also, “like” us on Facebook or follow us on Twitter (@HofstraCareer) for chances to win Amazon and iTunes gift cards for answering social media trivia questions throughout the month of March! We look forward to seeing you next Tuesday night! 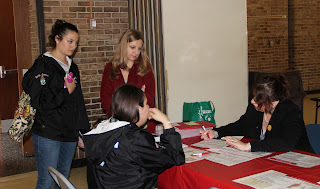 Registration is well underway and the Center for University Advisement is busier than ever! If you haven’t done so already, NOW would be a good time to call for an appointment to meet with your major advisor and your advisement dean. View your support team and check your registration status to make sure you don’t have any HOLDS preventing you from getting into those ‘MUST HAVE’ classes: On your portal click on Registration, then Registration Status. If you need assistance with the registration process or want a refresher, please click here for the video. 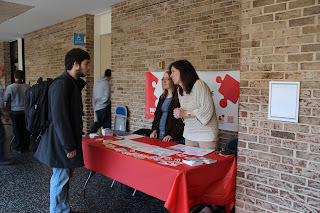 HAPPY REGISTRATION FROM THE CUA! 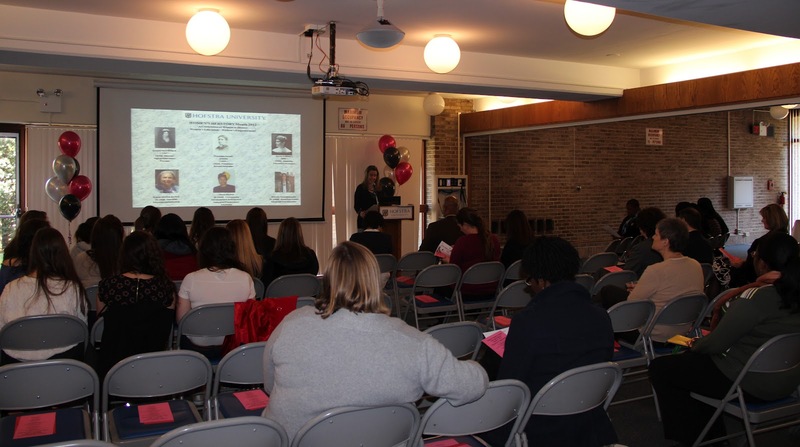 It's finally March and Hofstra is celebrating Women's "Herstory" Month, kicking it off with the opening reception earlier today. Every woman has a story and many of them have very special ones.Women's Herstory Month honors the history of women and their role and empowerment over time. Even more important though, it is told from the view of a woman. Women tell their stories of struggles, strengths, empowerment, education and growth. Their stories come from heart and personal experience, which make them so real and relatable. Even though nowadays women outnumber men in American colleges, this has only been a recent trend. Women's history and empowerment have come a long way with a long road ahead still. There are still many work fields, where men clearly outnumber women. Some of those areas are computer science, engineering and mathematics. Those areas are the so-called STEM fields. There is a lack of such areas in the U.S. overall, but specifically a lack of female participation. Hofstra does support a center for STEM research and encourages change and growth. Once women start learning more about such fields in their early childhood as now introduced, soon to be, we will have many female scientists, mathematicians and engineers. And who knows, women might soon outnumber men here too. I personally made a start with choosing to pursue a Masters in Computer Science. We also have so many women at our university that are the epitome of growth and strength and have their own story to tell. One of them is Chaundra Daniels, who was the keynote speaker of today's Herstory Month Reception, organized by the Office of Multicultural and International Students. Chaundra Daniels always seems to be the center of attention. With her impeccable charisma and sense of humor, she catches everybody's ear. It was inspiring to hear her talk and learn about her accomplishments and the big heart she has. Chaundra helps out many people in need to keep dreaming and make those dreams become a reality by getting them focused on an education and a career. The room was filled with so many strong females who also work in the Student Affairs Divison and Chaundra invited them all to stand up, to honor all those amazing women. The opening reception was a great introduction for many more Herstory Month events to come. Go listen to those strong women out there. They are right near you, maybe just right next to you. They inspired me and I am sure they will inspire you. The Office of Residential Programs likes to recognize Resident Assistants each month who go above and beyond in their role as an RA and stand out as truly inspiring individuals. For the month of February we want to congratulate Brittany Hinds, Gareth James, and Nicole Burke for their outstanding achievements! Brittany Hinds: RA in Bruekelen House in the Netherlands. Brittany has been an RA at Hofstra for three semesters. She started working in the Graduate Residence Hall and then moved to the Netherlands this year; certainly not an easy transition! Brittany has an amazing attitude and personality. 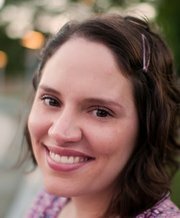 She is outgoing, personable and really takes the time to get to know the staff and residents. She has great relationships with them and is willing to help a fellow staff member in need. She knows quite a bit about her residents and their concerns, and is always caring and sensitive to the needs of first-year students. Brittany is exactly the opposite of the typical outgoing, burned out RA. She is three months shy of graduation and has already secured a job, but has only increased her dedication and hard work for the department. Thanks Brittany for all you do! Presented by Gareth James and Nicole Burke. This dynamic duo presented a program creatively named “A Kiwi Is Com ing”. This program was excellent and successful on several levels: Gareth James is an international student from New Zealand. He used this program as a way for residents to get to know more about him, learn about another country and learn about what it’s like for international students at Hofstra. The staff hosted a jeopardy game with a variety of facts about Gareth’s home country and information about international students and the unique challenges they face. Many of his favorite snacks from his home country were available for students to try. The event was titled, “A Kiwi Is Coming” because a kiwi is the national bird AND a fruit from New Zealand which was one of the trivia questions in his game. Awesome job Nicole and Gareth! Stay tuned next month to see who the winners will be for March!